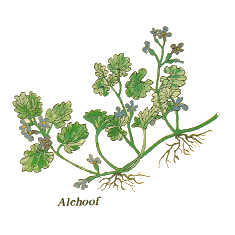 Also known as: Ground Ivy, Cat's Foot, Tun-hoof, Gill-go-by-the-ground, Hay-maids, Creeping Charlie, Run-away Robin aas well as many others. 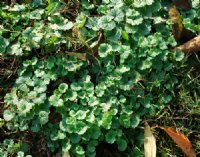 A creeping, trailing evergreen perrenial often found in garden beds used as groung cover or hanging baskets and also flourishes on sunny hedge banks and waste ground. Rounded and leaves and small purplish flowers. The leaves release a slightly balsamic aroma when crushed. Alehoof has long been used as a panacea of sorts. Traditionally it has been used to treat an assortment of conditions: chest and sinus infections, coughs, indigestion, fevers, headaches, stomach pains, colic in babies, weak backs, kidney disease. The juice of the leaf applied to the eyes is said to help with eye complaints and black eyes. The herb was also used at one time to cure 'painter's poisining' due to the power to remove heavy metals including lead from the body in the days of lead based paints. Alehoof was used by the early Saxons to clarify and preserve beer before the introduction of hops. ('Hofe'-the old english for herb.) The ancient herbalists wrote that tea from the herb was a cure for sciatica and bad backs as well as mouth ulcers, insaity, and regulation of the heart beat. It was used to prevent scurvy due to the high vitamin C content.